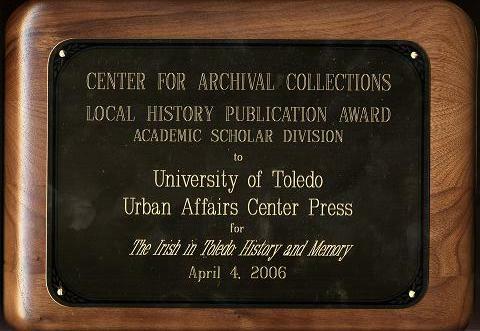 In April 2006 "The Irish in Toledo" received the 2006 Local History Award from the Center for Archival Collections at Bowling Green State University. The Irish in Toledo: History and Memoryis the story of the devastation and rebirth of a people and their culture-the bitter destruction of the Irish in their own country during the nineteenth century and their rebirth as a vibrant and creative community in a new land. Irish immigrants made their way to northwest Ohio because a brother or sister was already there or because laborers' jobs were plentiful. They came in waves after the potato famine of 1847-48, building railroads and canals, and working in sawmills and quarries. Sometimes they gathered together enough money to buy small farms. They built their own churches and schools and held their communities and their culture together under the firm hand of immigrant priests, despite often outright hostility from their neighbors. The book opens with details of the earliest emigration from Ireland to the United States and Northwest Ohio and tells the stories of two prominent, and sometimes intimidating, priests and the Irishman who shaped and led the newly created Toledo police department. The history of Irish nationalism in the area is also discussed. Memories shape the second half of The Irish in Toledo: History and Memory, opening with a remembrance of leaving home and starting a new life in another country-twice-as well as the stories of immigrants or first-generation children and how several Toledo families' Irish heritage shaped their lives. The book's final two chapters focus on other prominent Irish-American Toledoans and how their lives have affected and enriched the Toledo community over the last seventy years. 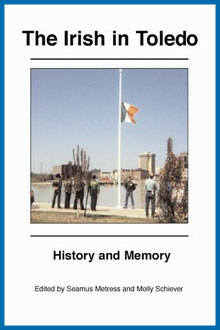 The Irish in Toledo: History and Memory (248 pages) has 70 illustrations, a map, an appendix, a list of suggested further readings, and an index. "Reflecting on Toledo and Ireland"
by Patrick Gorman at the Toledo Free Press.